SANRAL and Bell Equipment to work together to ensure growing businesses can participate more meaningfully in major projects. Seen from left are Leon Goosen, CEO BELL; Dumisani Nkabinde, SANRAL Eastern Region Regional Manager; Simphiwe Mxhosa, SANRAL Stakeholder Manager; Duncan Mashika, MD BELL Africa Sales & Distribution; Gary Bell, BELL Chairman; Skhumbuzo Macozoma, SANRAL CEO; Ismail Essa, SANRAL Transformation Manager and Bruce Ndlela, BELL Director: Public Sector. 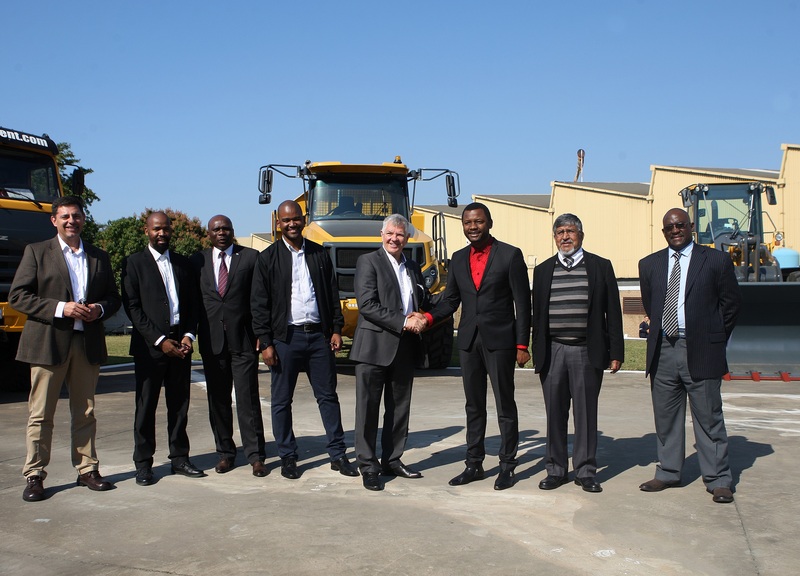 A joint undertaking by the South African National Roads Agency (SOC) Limited (SANRAL) and construction machinery supplier, Bell Equipment, will accelerate the transformation of the construction industry and open doors for black-owned and emerging enterprises. The roads agency and Bell Equipment have signed a Memorandum of Understanding that will give small contractors access to earthmoving machinery, enabling them to participate more meaningfully in major construction projects. “Our primary objectives are to grow the construction and engineering sectors, and attract new entrants, especially black contractors who can build businesses and create jobs,” said Skhumbuzo Macozoma, CEO of SANRAL. Access to sophisticated equipment used in construction has been identified as one of the biggest hurdles facing emerging companies. They often do not have the capital to purchase major machinery used for excavations, ground moving and the grading of roads. The cooperation between SANRAL and Bell Equipment will help to promote fair competition in the construction and engineering sectors. Black-owned contractors will now get access to finance, leasing and rental options, training and maintenance services. Bell Equipment is a proudly South African company with a global footprint and more than six decades of experience in the manufacturing of equipment used in the construction industry. “They bring a vast understanding of the local construction and engineering sectors and share our commitment to the transformation of the industries,” said Macozoma. Bell Equipment sees this as an opportunity to position itself as a road construction equipment supplier of choice. “This partnership with SANRAL will enable us to grow our customer base and contribute greatly to the empowerment of emerging contractors in the industry,” said Bell Chairman Gary Bell. Small contractors will now be able to purchase, rent or lease road construction equipment that will enable them to participate in major tenders where high standards of quality are required. Bell will also leverage its existing partnerships with the financial sector to give small contractors access to financing. Macozoma said the cooperation with Bell Equipment is a “trailblazing step for the South African construction industry”. It demonstrates SANRAL’s resolve to use its contracting and procurements processes to facilitate the growth of emerging contractors. Both Bell and SANRAL confirmed that they will host an information sharing session with black-owned and small businesses in construction to unpack how their collaboration will benefit them.